A few months ago, I had the best poop of my life. And so begins Depression Constipation, a tale of moving through depression with a sense of humour. 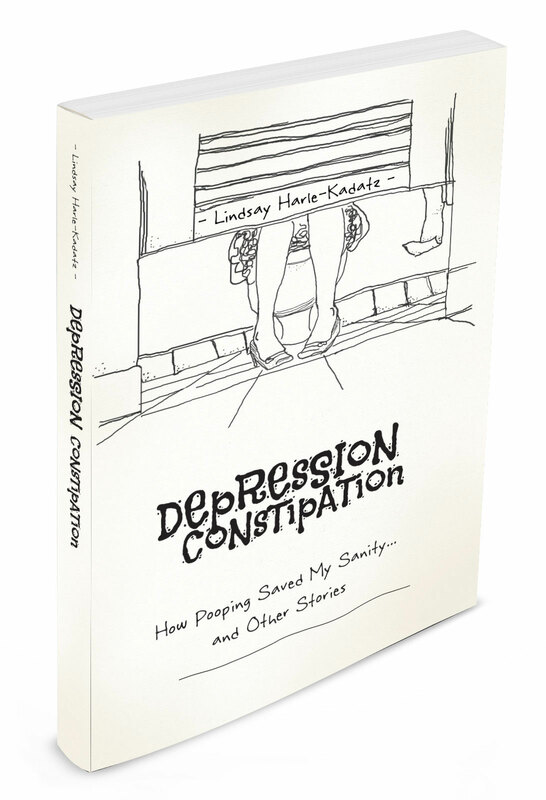 In Depression Constipation: How Pooping Saved my Sanity…and Other Stories, Lindsay Harle-Kadatz shares how she found her own prune juice when moving through her depression. Meant to encourage readers to find their own brain prune juice, while looking for the bright light in the dark, Depression Constipation shows how explosive events – whether big or small – are actually the start of movement to better things. Learn how pooping can truly save your life! I enjoyed this book so much that I read it in two days…. and that says a lot! The short stories all kept my attention. They were heartwarming, funny and sincere. I could relate to Lindsay and her struggle with her self-esteem and her eating disorder. She makes light of everyday embarrassments and awkwardness (which I also relate to) it’s awesome. I highly recommend this book to anyone who is looking for a laugh, a smile and a genuine good read. There is finally some mainstream attention being given to the spectrum of what can constitute mental illness. The use of easily recognizable citizens such as athletes and entertainers gives legitimacy to the reality that these issues occur at any age and in all demographics. It gives credence to the fact that mental health issues occur with the same frequency as do other health issues and should be treated as such. Harle-Kadatz contributes to this approach by demonstrating that issues of self-hatred and loathing are not limited to members of non or marginally functioning families or to those adolescents without families; they also occur to individuals from healthy, loving and supportive families. These individuals are frequently educated, competent, successful young women like the author, who has a network of supportive friends and employers. Her stories of struggle are told clearly, simply and with humour in a format easily understood by adolescents and young adults facing similar issues.